Duggar Family Blog: Duggar Updates | Duggar Pictures | Jim Bob and Michelle | Counting On | 19 Kids: More Duggar Hair Photos! 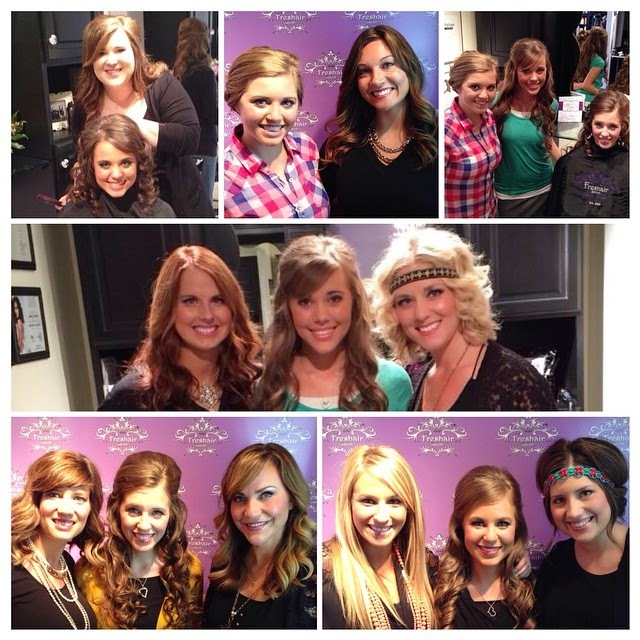 Here are a couple more snapshots of the lovely hairdos and makeovers that the stylists at Freshair Salon & Boutique did for the Duggar ladies this week on 19 Kids and Counting. Are you going to post the episodes on here for us readers who don't have access to them ? I would love to see them ! Joy sure looks nice with her like that! She looks like a country singer in the first photo. I love that fancy do! Pretty girl! Jana looks lovely with straight or curled hair. She is a natural beauty. Really, they all look beautiful! Those girls could be models, every one of them. Nice pictures, but less make-up would look better on the girls. What beautiful young ladies. Love your family and hearing about all the exciting things your families are doing. We are praying for all of you and your family. God bless..
Jess's bangs make her face look really long . . . I don't think its a good look for her. Jinger is still my fave!! They all look beautiful! But not natural at all. I'm sorry, but my opinion is that the girls don't look better at all with the hair and make up makeover. It makes them look like they have plastic, painted on faced and their hair isn't flattering it's out of style like that. They are really more attractive women with less make up on their faces and they would look much prettier with hair shorter in length. Their faces look unnatural. BTW, they didn't wear their hair like that for the actual wedding, so why did they waste an episode on this nonsense? The hair is lovely...did they do makeup, too? Just a thought, but there is much more black around the eyes these days, and these girls have gorgeous eyes that can be accentuated w/just a little bit of makeup. It seems Ginger is following through w/that same look recently. She is so beautiful w/just a touch! It puzzles me why people in business want to "cover" the girl...The Bible speaks of the egyptian woman wearing heavy eye makeup, so we should steer away from that look, yes? Otherwise, I LOVE the hair!! Big fan of your blog!! I have a major concern for the popularity and publicity your family is receiving.... Our family feels it has great potential to be the ruination of your family. We think we are see results already of this happening.... the glamour (make up), and style is one of those obvious ways. What happened to a pure beauty. ALso as far as modesty in footwear, there are ways to expose... heels certianly do things purity and simplicity would want to stay clear of. Shorter skirts are also very exposing. I hope you consider these thots. CUTE!! I have not gotten to see the last 2 episodes will you be posting them soon?! I believe these girls are beautiful inside and out! And to all the "haters", it sure is easy to bash these girls behind the name of Anonymous! Shame on you! Duggar girls, keep on keepin' on! You are all such great examples for young girls in an culture that makes modesty, and wholesomeness sound like boring and rigid things! Keep it up!! They look WAY better when they do their hair by themselves! And all the make up lately is too much! I'm not too conservative but I consider that kind of make up highly anapropriet, I hope the girls will change that as they get older. Im getting tired of the bee hive look of the top of the girls hair, they look like flashbacks of Priscilla Presleys hair from the 50's and early sixties.They need to do the top of their different. They are such beautiful girls, inside and out! Having heavy makeup and hair all fixed up for a day doesn't change their sweet personalities. It's fun to see them enjoying a girl's day out getting pampered! Love the whole Duggar family! The Duggars stated about the time Jill was courting that an engagement and subsequent marriage prep was appropriate only when certain things were already in place, ie financial stability and the capability to provide for wife and children. So why is Jessa getting married Nov. 1st as Ben is no where near there yet? The Duggar rerun episode that aired today was the one where Josie was rushed to the hospital and her parents were in El Salvador. Michelle was interviewed and said that she was glad that the older girls are adults and were capable of making tough choices quickly and making the correct ones under pressure....this was a while ago,.so, why can't they be alone with their guys? Can't they be trusted to make those same good choices under pressure now? Speak about talking out of both sides of your mouth. The eye makeup is plastered on way too heavy and dark. I am surprised based on their modesty standards that it goes out the window when it comes to makeup. Flying all the girls to Washington, D.C. to look for a dress seems so extravagant. Why shop at thrift stores and then fly out of state for a wedding dress??? "heels certianly do things purity and simplicity would want to stay clear of" ??? I'm sorry but Anonymous 12- How are heels in any way dishonest? They're just you're feet. You're not revealing anything. Hi, I mean no disrespect, but why so much emphasis on makeup, hair, clothes, and ... photos of it all? It seems a vain pursuit for folks who claim to have such high moral, spiritual standards. And, is there some kind embargo on more cerebral pursuits? Just because the older Duggar gals graduated from high school ... well, are they also done with academics or rigorous learning? This cheesy glamorizing business just make these young ladies look like some religious version of the Kardashian sisters who are all about the external. Super fun day for all! They are all naturally beautiful! Such sweet dispositions too! thanks for responding to hannah & hm from england about the newest episodes. i've also been waiting to see them posted here too and am very sad tlc has taken this stance. there are so many of us who have relied on the goodness of others posting the episodes here, so thank you to all who have done so! i have to say that your recaps of the show are fantastic! they are very well written so i dont feel like i've missed the show! my first question is, will you will still be able to write the informative recaps like you have been or do you have to stop those too? my other question is, have you considered making extra 'tabs' under the header? with so many people complaining about the coverage jill & derick get/got and now with jessa & ben, you could make a place for 'continuing coverage' of the couples (you could even add josh & anna). i'll be the first to admit i have no idea how these things work, and dont even know if this would be possible, but i was just thinking about it after reading the comments criticizing the coverage. i hope i dont sound like i'm criticizing because i certainly dont mean to. i've been re-reading your blog (i actually started at the beginning!) and appreciate all the hard work you two put into this. i cant believe how many times you've had to explain that you are not the duggars over the past 4+ years! (you really are very gracious!!) it's been great seeing how much you've grown, especially in your international readership. this is a great ministry for you two! @Anonymous 17 - it's just make up. I don't think they are or aren't "portraying" anything. they are the prettiest girls in this country, they make Christians look soooo cute but modest at the same time ... but even better is their wonderful spirit and attitude! anon @ 12:52pm ~ i dont understand about the heels? are you talking about heels as in shoes? or do you mean the heel of the foot? i'm very confused about the exposing heels part. as far as the glamour (make up) goes, i really dont see anything wrong in what they did. when they were in japan, it wasnt a problem when they dressed up and got made up in traditional japanese style. it was something they did together and had fun doing, even though they weren't going 'out' anywhere like that. same with the glamour shots done here. it was something they did together to have fun! i think everyone forgets that as the girls are getting older, there are things they would like to do to 'expand their horizons' and that may include trying on different styles of clothing and experimenting with make-up, while still keeping their modest standards. it hasn't changed their convictions any and they are still conducting themselves in the manner they've been raised, they are just being normal young women! they still dress modestly but are also wearing more up-to-date clothing. if they still wore the kind of clothes they wore when we first were introduced to them, then i'd worry! after all, my daughter (who is in their age group) has changed her style of clothing in the last 8 years, and she is still modest and without calling undue attention to herself! people complain because they feel like the girls, especially, are so being so sheltered, and when they do something that clearly indicates they are not sheltered and can make their own decisions, they complain about that too!! such is the life in the public eye i guess. Which of the girls' have natural curly hair? Straight? Way to much make up. girls are beautiful without makeup, and glamor. take you face and body as God our creator has made you! I think they all look amazing. Jill is the only one that I haven't seemed to grasp my liking onto. Joy is the prettiest duggger girl! I am from England and enjoy watching the Duggars but I can't believe how overly critical and self-righteous some of the comments on this blog are. The girls are all naturally beautiful and the make-over, yes including the make up, just highlights that and anyway who doesn't like getting dressed up once in a while for a special occasion. It doesn't make them any less Christian or modest to look the way they look in these photos. I think some people are just jealous because the girls are all natural beauties. Yes do you know when you will be putting the Jill Duggar wedding up? What church to Jill and Derick attend? Jim Bob's or Derick's family's? I think many of us out here would like to know practical things about Jill and Derick's settling in to marriage, like does Derick watch college football on TV on Saturdays? If so, does he watch it live, with commercials and cheerleaders shown? What does Jill do during that time, does she join him and watch too, or does she think it's sinful of him to watch? We really aren't interested in watching her baby bump progress, that's just not modest of her. Also, a good question was asked somewhere about their belief system and "marital things". Michelle had no qualms about her private life practices with Jim Bob, abstinence times after delivery, etc., which shocked me quite frankly. Having said that, what does their belief system say about abstaining during these 9 months? No one is asking what Jill and Derick are or are not doing, this is a general question about the belief system. I think her baby bump is cute and I enjoy seeing the progress! I don't see how it's immodest at all. It's a living thing growing inside of her. It's miraculous how your body will grow and support another life. The natural progression of an embryo to an infant should be witnessed by all. It is amazing and no one should be ashamed of their belly expanding. I doubt jill and Derrick have a tv. I have never/read heard anything about abstaining during 9 months of pregnancy unless your pregnancy is in danger. Michelle often speaks about her own wedding. She states advice given to her from a friend, but what advice did her own mother give her? Also, since Jim Bob has no brothers, who was his best man and who were his 2 groomsmen. Michelle addressed her attendants and I appreciated that. Does anyone know the girls natural hair style(curly,straight,etc.)? 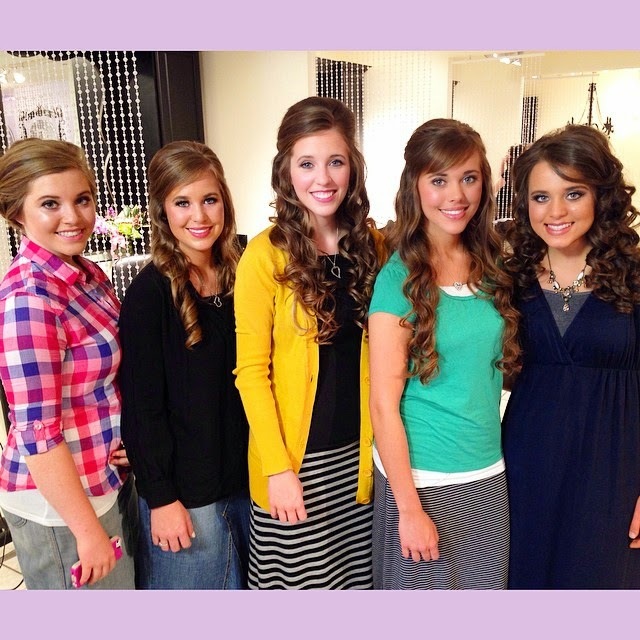 How old do the Duggar girls have to be to wear makeup??? I know Jessas natural hair is curly and jills is wavy but I don't know about the rest of the girls. I agree with Anon 32 - everyone is wishing those poor Duggar girls would get to go out & do something FUN. This was fun for them. And now they are being criticized. They were trying out different looks for the wedding. Do you not get a little glammed up when going to/ participating in a wedding?? There are so many things I disagree with when it comes to the Duggar family, but the biggest thing is that these girls don't get to do ANYTHING by or for themselves. Their parents don't trust them to even text their significant other in private. They always have to have chaperones even though they are adults. Please, let them have this & stop criticizing them. It looks like the had tons of fun & they deserve it. They all look amazing !!! Wow! Brings back bad memories of trying to find a salon to do my hair for my wedding. They wanted to put it all puffy like this salon did to these girls. Having naturally curly hair they still wanted to straighten it and curl it with a curling iron. I looked like a clown. I ended up doing my own hair for my wedding and loved it much better. I think sometimes we know ourselves what looks best on our heads. On another note, would love to see a tutorial on how to do all the cute hairstyles they do with their little girls hair! I need to learn some new tricks for my little girls! Thank you for your kind words about our blog. We are blessed to have you as a reader. Anonymous 37- I totally agree! I think they are going too far. But I would also like to say that our Creator shows different people different things at different times and its not up to us to change someone elses hearts. I also appreciate the things the Duggars do stand for that are right.